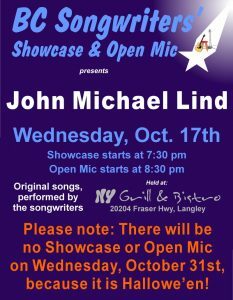 On Wednesday, October 17th, BC Songwriters are pleased to present John Michael Lind, in our Songwriter Showcase, starting at 7:30 pm. BC Songwriters hold their Songwriter Showcase & Open Mic Performances at NY Grill & Bistro – 20204 Fraser Hwy, Langley. 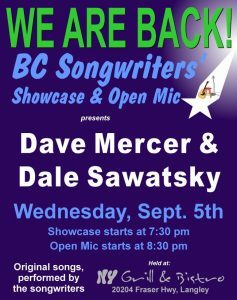 featuring Dave Mercer & Dale Sawatsky, starting at 7:30 pm. Open Mic follows at 8:30, for anyone who has an original song or two. As before, BC Songwriters hold our evenings at NY Grill & Bistro – 20204 Fraser Hwy, Langley. 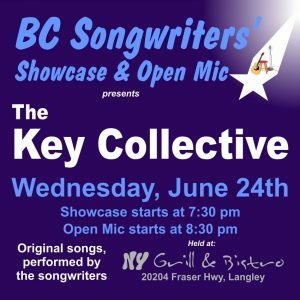 On Wednesday, June 24th the Songwriter Showcase will feature ‘THE KEY COLLECTIVE’, featuring Patricia Dunphy, Will Firstbrook & Lori Firstbrook, starting at 7:30 pm. Open Mic follows at 8:30, for an hour of original music, performed by the songwriters. BC Songwriters’ Showcase & Open Mic performances are held at NY Grill – 20204 Fraser Hwy, Langley. “Open Mic – All Night”!!! Two hours of Open Mic, starting at 7:30 pm. Bring and sing your original songs… old and new. BC Songwriters’ provides everything: complete sound system… Bob Batyi, the best sound guy around… a “house guitar”… and this time, a keyboard will be on hand, as well. BC Songwriters hold their evenings, every other Wednesday, at NY Grill & Bistro – 20204 Fraser Hwy, Langley. On Wednesday, May 16th, BC Songwriters’ features a Two Hour Open Mic, starting at 7:30 pm. Original songs only, as always. Sign up early to make sure you get your chance to perform your songs. 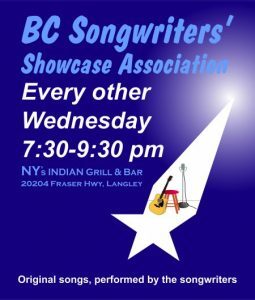 BC Songwriters hold their events at NY Grill & Bistro – 20204 Fraser Hwy, Langley. 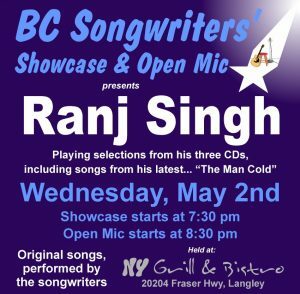 On Wednesday, May 2nd, the Songwriter Showcase will feature Ranj Singh, performing his awesome songs, starting at 7:30 pm. Open Mic follows, at 8:30, for anyone with an original song, or two. Sign up is in person only, and done on a “first signed-up, first singing” basis. 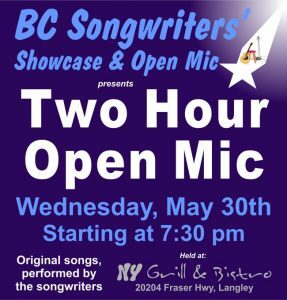 BC Songwriters hold their Showcase & Open Mic performances at NY Grill & Bistro – 20204 Fraser Hwy, in Langley.